On the deep space merchant ship Parastrata, polygamy is the norm, women are second class citizens, and traditional gender roles are strictly enforced. When Ava, an unmarried teen, choses to give her virginity to the boy she loves rather than waiting for a husband of her family’s choosing, she is banished from the only home she’s ever known. Ava knows she cannot survive on her own, so she decides to travel Earth-side to find her mother’s long-lost half-sister. Along the way, she gains a new sense of self-awareness, and learns some hard lessons that challenge the conservative values she was raised with. 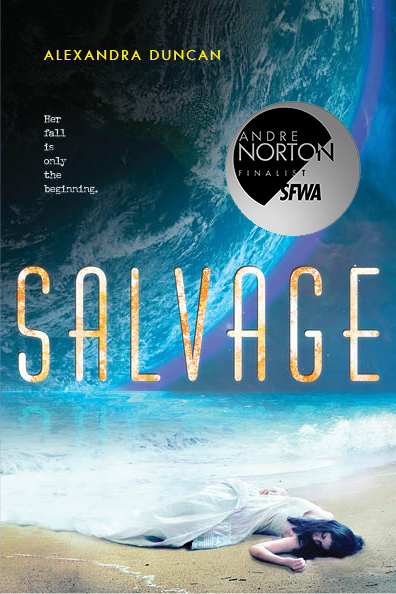 A smart sci-fi tale with a feministic twist, Salvage is recommended for Ages 16-18, particularly for fans of Wither and other girl power-themed stories.